Puli koddel is another popular konkani dish. It is made for special occasions as it doesn't have onion or garlic. This dish has the fresh flavors from the spices, sweetness from jaggery, sourness from tamarind and the sesame seeds (special ingredient which gives a different taste as well as a dark color to the dish), together makes it delicious. 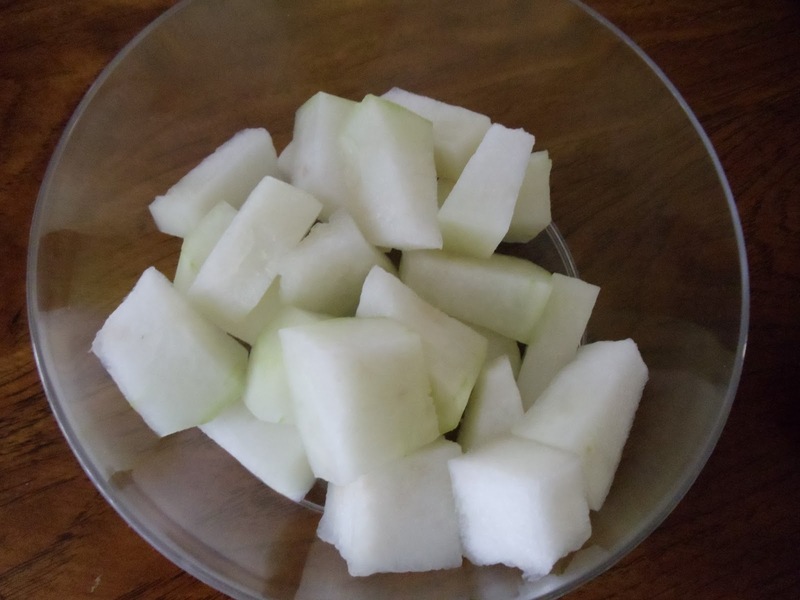 Remove the peel and seeds of the ash gourd and cut in to pieces. Cook these pieces in a cooker (two whistles) by adding little water and salt to taste. To prepare masala: Roast coconut until light brown and allow it to cool. Now fry coriander seeds, chanadal, cumin, fenugreek, asafoetida, turmeric, sesame seeds and rice with little oil (I fried sesame seeds and rice separately without adding oil and the rest together with little oil. You can also add few curry leaves while frying which enhances the taste of the masala as well as adds more iron into it). After everything gets cooled, grind all of them together along with roasted red chillies and tamarind. Add little water which will help to give a smooth paste. Add this masala to the cooked ash gourd and mix well. Bring it to a boil. Now add jaggery and check for salt. Add water, if required to get the right consistency (don't make it too watery). After it comes to a boil, continue heating for five more minutes and turn off the heat. For seasoning- heat oil and add mustard seeds. Once it starts spluttering, add curry leaves and turn off the heat. Add it to the prepared curry and mix well. Puli koddel is ready!! Serve it hot with rice, dosa or rotis. Above measurement serves 2-3 people.